Generously proportioned seat and back cushions support longer periods of use. Neutral vinyl upholstery matches any environment so you can change your aesthetics without changing your chair. Swivel/tilt function allows the chair to recline effortlessly, promoting movement and comfort throughout the day. Padded armrests and integrated headrest provide comfortable support. Simple four-step assembly allows you to enjoy your chair almost immediately. Tilt tension and tilt lock allow for greater personalization of comfort. When you want an upscale look at a low price, this is the chair for you. Generously proportioned seat and back feature supple vinyl upholstery with distinctive contrast stitching. 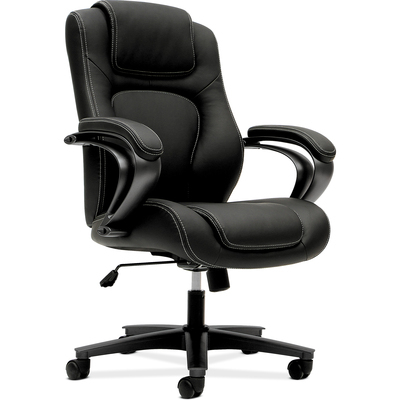 Padded armrests and integrated headrest provide comfortable support.